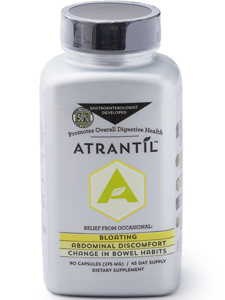 Atrantil was researched and created by a board certified gastroenterologist to provide overall digestive health and successfully help those suffering from bloating and abdominal discomfort associated with IBS and SIBO. The ingredients in Atrantil work together and remain intraluminal, meaning, they don’t really get absorbed or they are very poorly absorbed. The first ingredient is peppermint leaf (M. balsamea), which contains polyphenols that calm the area, allowing the other two ingredients to do their job. The second ingredient is Quebracho Colorado, a very large flavonoid and polyphenol, which actually soaks up the hydrogen and absorbs gas from the intestine, starving the archaebacteria. Quebracho Colorado comes from the bark of a very old tree that actually has natural defense against fungus and archaeal species, by weakening their cell wall. The third ingredient, the Conker Tree known as a saponin, does two things. It kills bacteria and shuts off the enzymatic production of methane from the archaeal species. These three ingredients found in Atrantil (1st calms the area, 2nd starves the achaebacteria, and 3rd shuts off the methane production) can help those experiencing IBS and SIBO related symptoms. Suggested Use: Take 2 capsules 1 to 3 times per day, with food.